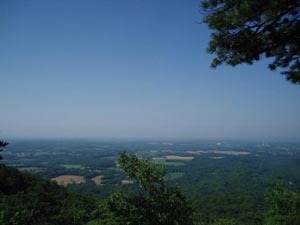 Description: This is a moderate 7.4 mile loop that includes visits to several vistas. Sugarloaf Mountain is an oddity, similar to but smaller than Massanutten Mountain further west. It is a solitary mountain that sits in the middle of farmland between the beginning of the Piedmont Plateau and the Blue Ridge Mountains. The park is privately owned by the Stronghold Corporation but open to the public so please take care of it! The hike begins at the East View Parking Lot. 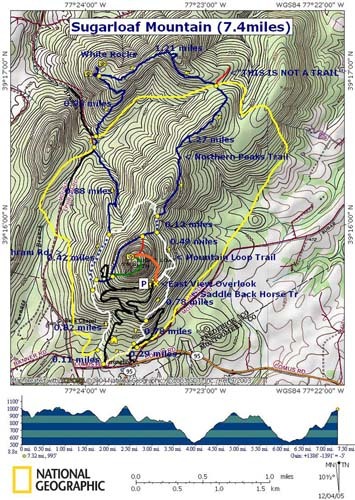 Trail Notes: From the parking area take the spur trail (white diamond blazes) to white blazed Mountain Loop Trail. Turn left. In about 0.5 miles the blue blazed Northern Peak Tr will come in from the left. Continue straight (right) on the dual white/blue blazed Mountain Loop/ Northern Peaks Trail. * Soon the white blazed Mountain Loop Trail will leave to the left. Continue straight on the single blue blazed Northern Peaks Tr. Note: If you want to bag a couple of more vistas and add a short but challenging rock scramble start the hike by turning left at the kiosk onto the orange blazed Sunrise Tr and almost immediately start a steep rocky climb. Near the top the trail flattens out. Turn left on a red blazed and follow it to the summit. After you take in the vista follow the red trail back down, passing the orange blazed Sunrise Tr you came up on to the right, to the blue blazed Northern Peaks Trail and the Charles Lambert (McCormack) Vista. Turn right here and follow the blue blazes out to the white blazed Mountain loop Trail. Turn left here and pick up the remainder of the directions marked with an * above. In another 1.2 miles descend and cross yellow blazed Saddle Back Trail. Avoid the woods road signed "THIS IS NOT A TRAIL" off to the right. Follow the blue blazes and sign for White Rocks. Climb back up to the top of a peak, pass a gigantic cairn and a defunct section of the blue trail to its left (You just hiked up the reroute.) and in about 1.2 miles from the last trail junction arrive at White Rocks, a great lunch spot with both north and south views. 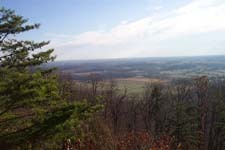 Climb for about 0.9 miles to an intersection with white blazed Mountain Loop Trail. Turn right ( straight) here and follow the dual white/blue blazes. The blue blazed Northern Peaks Trail will soon turn off to the left as well. (If you wish/need to shorten the hike you can take this trail up to the Western View area and take the park road back to the East View Area.) Continue on the white blazed Mountain Loop Tr. 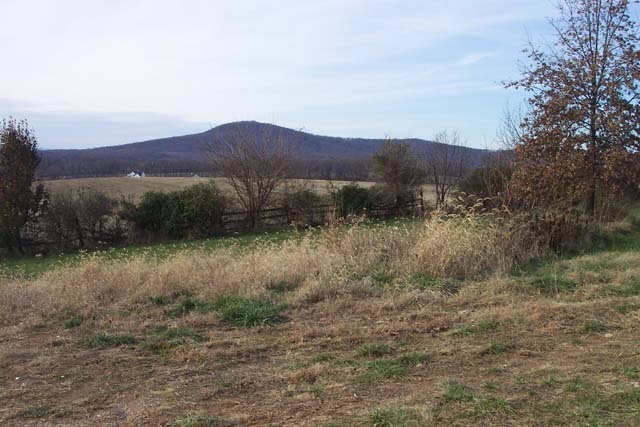 There will be another spur to the left that will take you to the Potomac Overlook. (If you visit it return to the Mountain Loop Tr and turn left.) Arrive at an old road and the junction of yellow blazed Saddle Back Tr at the base of the mountain (about 0.6 miles from the last trail junction). The yellow blazed Saddleback trail will share the tread for a while. Turn left onto this road for a few hundred feet and then right on another park road. . Pass the Stronghold mansions and turn left onto the main park road behind the farm buildings you drove through when you arrived at the park. Soon the white blazes re-enter the woods on a footpath to the left. Climb about 0.7 miles back to your car. You'll cross the park road one more time before the steepest climb. Critique: I ran the mountain today. Have been hiking and running here since I was a little kid. This is one of my favorite spots to hike or run. There is a network of loop trails and summit trails here that allow you to create a route suitable for you. Personally, I like parking at the bottom of the mountain at the entrance gates. I take the white trail up to the East Overlook, climb to the summit on the orange trail, go down the red trail and then complete the circuit around the mountain on the blue and white trails. Although the mountain is not very high, it's a lot higher than any of the surrounding land, so there are a number of great views. The summit is nice, but I think the best views are probably from White Rocks at the north end of the blue trail. The trails are also fairly steep as a result of the difference in elevation. Nothing insane, but there are some climbs. The only one that might cause anyone any trouble is the orange trail, but it's a blast if you like steep, rocky trails. Some of the trails are suffering from erosion and braiding from all the use and abuse, especially around the summit area, but they still have a nice flow to them. 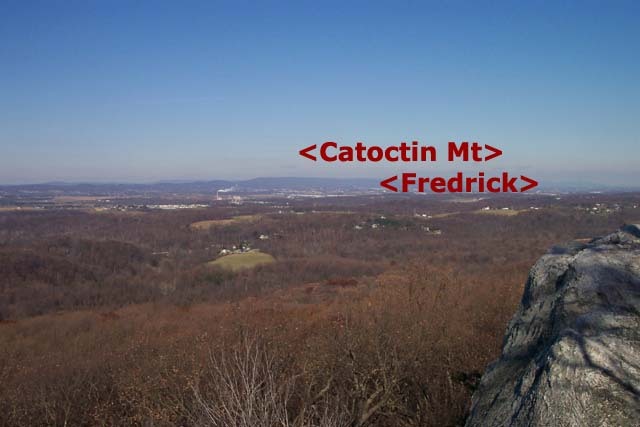 Being the closest mountain to DC is this area's only drawback. It's convenient for a quick getaway with a real mountain flavor, but don't expect any solitude unless you come early on a weekday in bad weather. Parking can also get tight in some of the smaller lots. Critique: I was really looking forward to this hike, and was disappointed on so many levels. First, we opted to take the "scramble" up the orange blaze; we are experienced hikers who just finished a week in the Eastern Sierra. It was horrible. The trail is suffering massive erosion, and is a *very* steep grade of nothing but rocks and roots. Calling it "steep" is disingenuous; it is treacherous, especially considering that many people were hiking with young children who were crocs and flip flops. M.R. Hyker Notes: I don't think we can be any clearer than the warning in red posted in the Trail Notes. We cannot be responsible for parents who let their children wear crocs or sandals when hiking. That is neglect on their part. The mountain was far too crowded for me. Noisy crowds of people everywhere. Critique: Stronghold Corporation opens the park at 8 am, so don't make the same mistake I did and time your arrival for a dawn summit. I ended up driving around Hyattstown for an hour. The trails at Sugarloaf intersect each other like a spider web, so unless you visit White Rocks you're never really more than a mile from your car. If you want a REAL rock scramble, there's an unofficial rock wall between the two parking lots (closer to the East View). Despite that you are parking only about 200 feet below the summit, the vista is very good on a clear day. Graffiti artists have sullied the summit and the West View, unfortunately. Don't forget to contribute a rock to the cairn. Critique: A small group of us hiked this great trail on a warm Sunday. While it was Memorial Day weekend, we found only moderate crowds on the orange trail leading to the top of Sugarloaf. The parking lot wasn't even entirely full. The crowds thinned out considerably once you get on the blue Northern Peaks Trail and/or white Mountain Loop Trail. 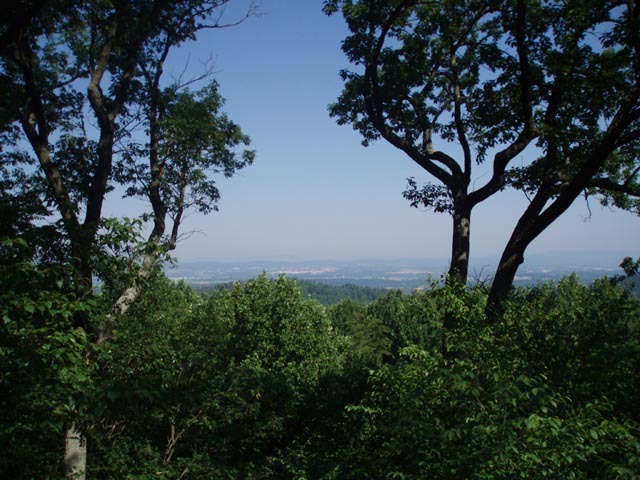 The route offered great vistas, as well as tree cover over a vast majority of the loop trail, keeping hikers as cool as possible. Critique: First off, someone needs to proof read the directions - particularly the ones on the "Printable/downloadable directions." I printed that off to lead a hike of 9 other ladies yesterday. Some of the ladies had printed off the first page of the hike site instead. That page is correct - the "printable" ones are not. Specifically - the front page of the hike says to come down to Mt. Ephraim road, turn left, cross a stream, etc. THAT is correct. The "printable" directions tell you to turn RIGHT on Mt. Ephraim road and says nothing about a stream crossing. That is completely wrong. Also - where the map shows the Green Trail running right into the Blue Trail.....either it actually does not meet the Blue Trail or it is so poorly blazed that it is impossible to figure out where they connect. We followed it to where the staircase comes up - and from there lost all trace of it. No blazes, no indications of where to go next. So we backtracked and followed the Red Trail back to the Blue. One vista point is listed as the "Lawton vista" on the directions but when you get there the name of it on the signpost is "McCormack vista." The Blue Trail comes up to a cleared area, about 1/2 or mile or so before White Rocks, where there is an old stack of stones - appears to have been an attempt at a structure of some kind. From there the Blue Trail goes both to the right and to the left. The directions say nothing about either this "land mark" or which way to go. Fortunately we had a copy of the map and figured it out. If someone is hiking only with the printed directions, they'd wouldn't know which way to go. I'd have given this hike a 5 but for the incredibly bad blazing and signage. M.R.Hyker Note: Corrections have been made. The stone steps are part of the Green trail. They lead to the road. Turn right when you reach the road and in a short distance you'll find the Blue trail. Critique: This was a fun little hike. The only problem is that it was over way too soon! There are a lot of good views, for very little effort. It was Memorial Day weekend, with temps in the eighties, so the mountain was busy and full of families with young children. There sure was a lot of noise going on at White Rocks, so we only stayed long enough to choke our lunch down. Of course the noise did not prevent us from getting some great photos. Most of the trails are quite rocky, but all in all, they are well maintained and well blazed. The views from each of the vistas are outstanding. Please note that a map or some other navigational aid is necessary. The trails are a bit confusing, and I ran across one person who was just plain lost. The trail description and map provided here makes it easy. Sugarloaf is worth the trip, I'm just not sure I would go out of my way to repeat. Critique: I enjoyed this hike. I agree with Heather (Mar 06) that the last part of the hike is a bit to steep for my liking but that could be solved by simply doing the hike, as suggested, in reverse. Aside from that I didn't encounter that many people (though there were a lot of cars parked there...where were they all at??) and the trails are well marked and maintained. Overall, I think it's a great way to spend a few hours and plan on going back later on in the fall when the leaves change color.